GLENDALE, Ariz. — Phoenix Coyotes goalie Mike Smith had plenty of idle time on his hands, watching his teammates push the Vancouver Canucks to the outside, limiting their chances. It may have been a bit dull at times, but it’s just the way he likes it — and the way his team needs to play on a more consistent basis. Antoine Vermette scored late in the first period, Smith stopped 23 shots and the Coyotes got back to their defensive ways in a 1-0 win over the Vancouver Canucks on Tuesday night. "It was a pretty boring game from my standpoint, but I think that’s a good thing," said Smith after his third shutout of the season and 27th in his career. "We did a lot of good things, kind of snuffed them out of chances, kept them to the outside and, for the most part, didn’t give up many Grade A scoring chances." After some shaky performances coming out of the Olympic break, the Coyotes seemed to get back in their defensive groove against St. Louis on Sunday. They only managed to do it for 40 minutes, though; the Blues scored four goals in the third period of the 4-2 win. Phoenix had a strong night in its own end against the Canucks for the entire game, blocking shots, forcing Vancouver’s offensive play to the boards, limiting their scoring chances. The Coyotes held the Canucks without a shot for nearly 13 minutes of the second and third periods, and Smith made some tough saves down the stretch when Vancouver turned up the pressure. The much-needed victory allowed the Coyotes to leapfrog the Canucks in the Western Conference standings to tie Winnipeg for ninth with 68 points. "If you’re going to be a playoff team, you’ve got to earn your way in," Coyotes coach Dave Tippett said. "If we play the right way, get a few bounces and stay healthy, we can get a run just like anybody else." The Canucks received a shock earlier in the day when veteran goalie Robert Luongo was traded to Florida. Their inability to get good scoring chances was nothing new. Eddie Lack kept Vancouver in it with 31 saves, but Vancouver had a hard time generating much in the Coyotes’ zone to lose for the ninth time in 10 games. The Canucks have eight goals in eight games. "There’s been some games where we’ve created scoring chances and haven’t scored," Canucks coach John Tortorella said. "Tonight, we had trouble creating scoring chances." Both teams needed a jump-start after slipping down the Western Conference pecking order. Vancouver lost seven straight games before the Olympic break and followed a victory over St. Louis by losing to Minnesota, then Ottawa. Adding to the Canucks’ problems, Daniel Sedin, tied for the team lead in points, suffered a lower-body injury against the Senators and was out against the Coyotes. Phoenix has been inconsistent since starting the season strong, following wins against some of the NHL’s best teams with losses against some of the worst. Despite saying they needed to play with urgency, the Coyotes have labored since the Olympic break ended, earning one point in three games. Phoenix has had trouble holding leads, coughing it up five times in the past 11 games, including Sunday’s 4-2 loss to the Blues, when they gave up four goals in the third period. Vancouver had a similar problem against the Senators, allowing four straight goals after going up 2-0. 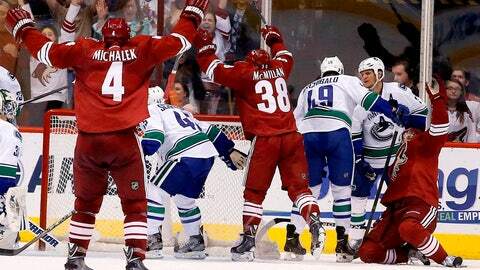 The Coyotes and Canucks played with a testiness expected between two teams scrapping for a playoff spot, with plenty of hitting, pushing and shoving throughout the first period. Phoenix had good pressure in the period and broke through late when Vermette fought off two Canucks and took a couple of swipes before knocking in a rebound for his 22nd of the season. The Coyotes kept up the pressure in the second period, but Lack was sharp, making some tough saves, particularly during an early Phoenix flurry. Vancouver couldn’t find any holes in Phoenix’s defense, though, failing to get a shot on goal for nearly 13 minutes or anything past Smith despite turning up the offensive pressure in the third period. "We really fought battled hard, but didn’t get many shots on goal," Lack said. "But it’s been like that for the last month or so. It’s real important we start getting shots on net."